Look into the heart of the ocean! The ocean hides many secrets, riddles and myths. 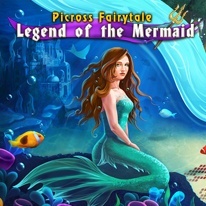 This time, you'll travel from the distant middle ages to an underwater world along side the Mermaid and the Woodcutter, and solve the mystery of the disappearing siren voices! A multitude of quests and varied underwater kingdoms with their secrets await you. - Japanese crosswords that come alive with light once they’re solved! - 5 different worlds and 200 unforgettable levels! - Cute ocean dwellers: dolphins, crabs, fish, starfish, octopi and many more! - A story of magic, mages and mystical spells!